Ground Propagation: In this, radio waves travel through the lowest portion of the atmosphere, hugging the Earth. These low-frequency signals emanate in all directions from the transmitting antenna and follow the curvature of the planet. Sky Propagation: In this, higher-frequency radio waves radiate upward into the ionosphere where they are reflected back to Earth. This type of transmission allows for greater distances with lower output power. Line-of-sight Propagation: in this type, very high-frequency signals are transmitted in straight lines directly from antenna to antenna. Electromagnetic waves ranging in frequencies between 3 KHz and 1 GHz are normally called radio waves. Radio waves are omnidirectional. When an antenna transmits radio waves, they are propagated in all directions. This means that the sending and receiving antennas do not have to be aligned. 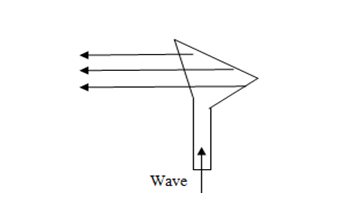 A sending antenna send waves that can be received by any receiving antenna. The omnidirectional property has disadvantage, too. 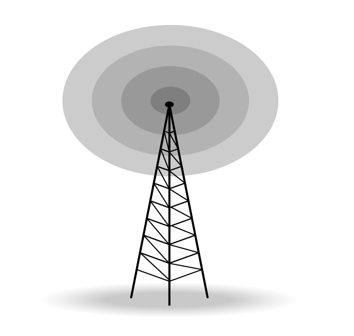 The radio waves transmitted by one antenna are susceptible to interference by another antenna that may send signal suing the same frequency or band. Radio waves, particularly with those of low and medium frequencies, can penetrate walls. This characteristic can be both an advantage and a disadvantage. It is an advantage because, an AM radio can receive signals inside a building. It is a disadvantage because we cannot isolate a communication to just inside or outside a building. Electromagnetic waves having frequencies between 1 and 300 GHz are called micro waves. Micro waves are unidirectional. When an antenna transmits microwaves, they can be narrowly focused. This means that the sending and receiving antennas need to be aligned. The unidirectional property has an obvious advantage. A pair of antennas can be aligned without interfering with another pair of aligned antennas. Microwave propagation is line-of-sight. Since the towers with the mounted antennas need to be in direct sight of each other, towers that are far apart need to be very tall. Very high-frequency microwaves cannot penetrate walls. This characteristic can be a disadvantage if receivers are inside the buildings. The microwave band is relatively wide, almost 299 GHz. Therefore, wider sub-bands can be assigned and a high date rate is possible. Use of certain portions of the band requires permission from authorities. Microwaves need unidirectional antennas that send out signals in one direction. 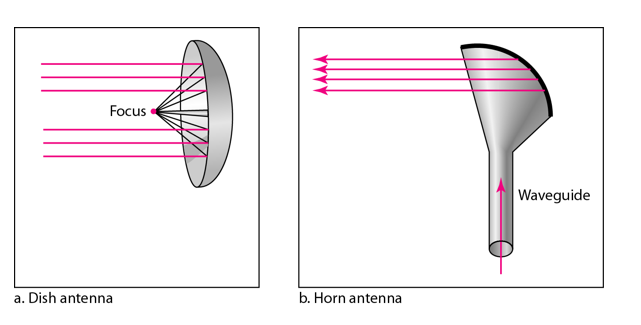 Two types of antennas are used for microwave communications: Parabolic Dish and Horn. A parabolic antenna works as a funnel, catching a wide range of waves and directing them to a common point. In this way, more of the signal is recovered than would be possible with a single-point receiver. A horn antenna looks like a gigantic scoop. Outgoing transmissions are broadcast up a stem and deflected outward in a series of narrow parallel beams by the curved head. Received transmissions are collected by the scooped shape of the horn, in a manner similar to the parabolic dish, and are deflected down into the stem. Microwaves, due to their unidirectional properties, are very useful when unicast(one-to-one) communication is needed between the sender and the receiver. They are used in cellular phones, satellite networks and wireless LANs. In this every line parallel to the line of symmetry reflects off the curve at angles in a way that they intersect at a common point called focus. This antenna is based on geometry of parabola. It is a like gigantic scoop. The outgoing transmissions are broadcast up a stem and deflected outward in a series of narrow parallel beams by curved head. This is a microwave relay station which is placed in outer space. The satellites are launched either by rockets or space shuttles carry them. These are positioned 36000 Km above the equator with an orbit speed that exactly matches the rotation speed of the earth. As the satellite is positioned in a geo-synchronous orbit, it is stationery relative to earth and always stays over the same point on the ground. This is usually done to allow ground stations to aim antenna at a fixed point in the sky. Bandwidth capacity depends on the frequency used. Satellite microwave deployment for orbiting satellite is difficult. Transmitting station can receive back its own transmission and check whether the satellite has transmitted information correctly. A single microwave relay station which is visible from any point. Infrared waves, with frequencies from 300 GHz to 400 THz, can be used for short-range communication. Infrared waves, having high frequencies, cannot penetrate walls. This advantageous characteristic prevents interference between one system and another, a short-range communication system in on room cannot be affected by another system in the next room. When we use infrared remote control, we do not interfere with the use of the remote by our neighbours. However, this same characteristic makes infrared signals useless for long-range communication. In addition, we cannot use infrared waves outside a building because the sun's rays contain infrared waves that can interfere with the communication. The infrared band, almost 400 THz, has an excellent potential for data transmission. Such a wide bandwidth can be used to transmit digital data with a very high data rate. The Infrared Data Association(IrDA), an association for sponsoring the use of infrared waves, has established standards for using these signals for communication between devices such as keyboards, mouse, PCs and printers. Infrared signals can be used for short-range communication in a closed area using line-of-sight propagation.